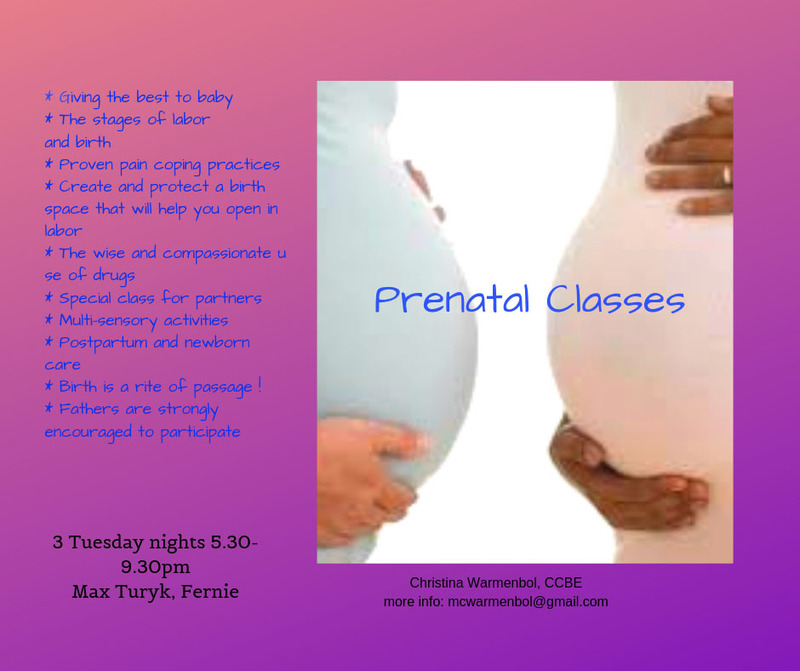 3-day Prenatal Class in Fernie hosted by doula and childbirth mentor Christina Warmenbol. Dads are welcome too please! April 23, 30 & May 7, 5:30 to 9:30pm. Christina Warmenbol, Doula and Childbirth Mentor, is passionate about the beginnings of life. She lectures, teaches childbirth classes and accompanies women who gave birth as a postpartum doula. As a therapist, through a blend of practices she helps you free yourself from emotional balast or the emotional roots of a physical problem to uncover the level of your true self. This is done by working on experiences dating from the pre-and perinatal period. Services in Cranbrook, Fernie and Jaffray.